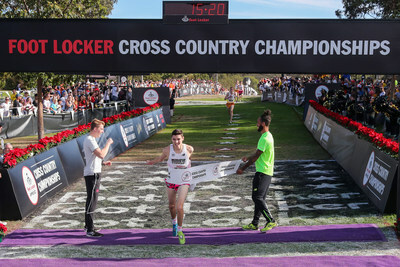 SAN DIEGO, Dec. 9, 2017 /PRNewswire/ -- Claudia Lane of Malibu, Calif., and Dylan Jacobs of Orland Park, Ill., captured first place titles at the 39th Annual Foot Locker Cross Country Championships (FLCCC) National Finals at Morley Field, Balboa Park in San Diego, today. Race conditions were ideal with dry terrain, sunshine and temperatures reaching 63 degrees Fahrenheit. Dylan Jacobs of Orland Park, Ill., captured first place in the boys race at the 39th Annual Foot Locker Cross Country Championships (FLCCC) National Finals at Morley Field, Balboa Park in San Diego on Dec. 9, 2017. 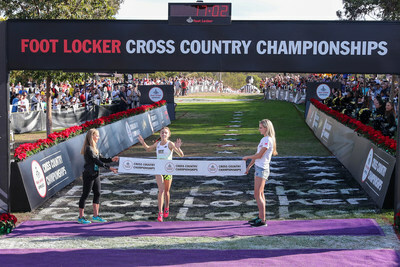 Claudia Lane of Malibu Calif., captured first place in the girls race at the 39th Annual Foot Locker Cross Country Championships (FLCCC) National Finals at Morley Field, Balboa Park in San Diego on Dec. 9, 2017. In the girls' 5K race, Claudia Lane successfully defended her 2016 FLCCC national title with a wire-to-wire victory in 17:03.4. With the win, Lane became FLCCC's ninth two-time champion in its history. In the boys' 5K, Dylan Jacobs took control at the halfway mark, en route to a 15:19.7 victory. Lane, still only a junior, jumped out to a sudden lead in the girls' race and sailed through a mile split of 5:17. A well-formed pack trailed her by 14 seconds with Marlee Starliper (Wellsville, Pa.) at the head. Lane kept the pressure on at the race's halfway mark where the duo of Katelynne Hart (Glen Ellyn, Ill.) and Olivia Theis (Lansing, Mich.) surged past Starliper and initiated a side-by-side charge for second place. Lane, like last year, charged across the final steep uphill/downhill portion of the course and began her push to the finish line. Hart, meanwhile, outkicked Theis over the final 200 meters to finish second (17:22.5) with Theis third (17:22.6). Katherine Lee (Wading River, N.Y.) finished fourth (17:38.3) and Jacqueline Gaughan (Exeter, N.H.) fifth (17:44.6). In the boys' race, two-time FLCCC national qualifier Jacobs (placed 11th in 2016) waited in a large lead pack that started out conservatively with a mile split of 4:56 with Kashon Harrison (Fruitland, N.M.) in command. After Dalton Hengst (York, Pa.) grabbed a slight lead on the first steep downhill, the race finally began to spread out. It became a two-man duel at the halfway mark, with Jacobs being closely tracked by Daniel Kilrea (La Grange Park, Ill.) through a two-mile split of 9:49. Kilrea managed to nudge ahead briefly before Jacobs made his second big move on the final big hill, leaving Kilrea to fend off the late charges of John Tatter (Winston-Salem, N.C.) and Graydon Morris (Aledo, Texas). In the final mile it was all Jacobs (15:19.7) while runner-up Morris (15:23.3) overtook Kilrea (15:27.3), who held on for third with Tatter crossing the finish line fourth (15:27.9). Jake Renfree (Knoxville, Tenn.) rounded out the top five (15:38.7). Foot Locker is part of Foot Locker, Inc. (NYSE: FL), a specialty athletic retailer that operates more than 3,350 stores in North America, Europe, Australia, and New Zealand. Through its Foot Locker, Footaction, Lady Foot Locker, Kids Foot Locker, Champs Sports, SIX:02, Runners Point, and Sidestep retail stores, as well as its direct-to-customer channels, including footlocker.com, Eastbay.com and SIX02.com, the Company is a leading provider of athletic footwear and apparel.